Jersey City Eats: Mordi's Schnitzel Truck! Mordi's Schnitzel Truck joined the growing ranks of Jersey City food trucks a couple of months ago, and ever since, the rave reviews have been pouring in. With a menu based more in the Israeli/Mediterranean style rather than Eastern European, Mordi's offers chicken and eggplant schnitzel on sandwiches and salads. On my first visit, I ordered the schnitzel I'd been hearing the most about, the Vegetarian. 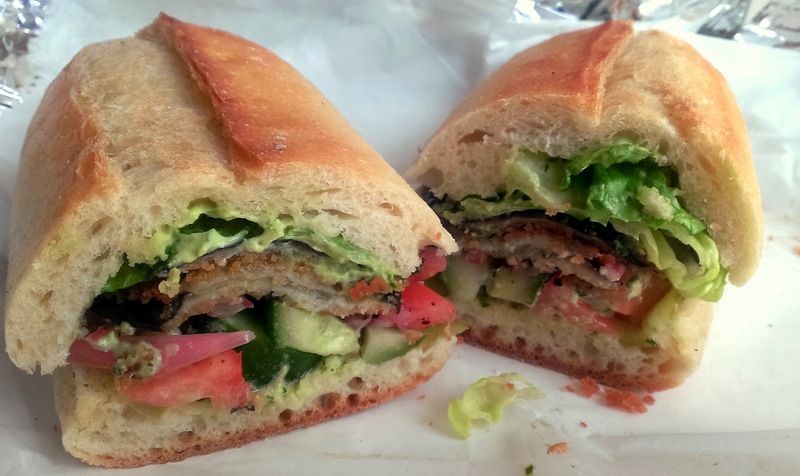 Made with eggplant schnitzel (thin pieces of eggplant breaded and fried), the Vegetarian is served on an Italian baguette spread with house-made parsley tahini and topped with lettuce, tomato, pickles, cucumber and sumac pickled red onions. Even as I placed the order, another customer waiting turned to me and nodding sagely, said "Good choice".... so the bar was set pretty high. And I'm very happy to report all my expectations were met and then some. The eggplant was thin but substantial with a perfectly-fried crunchy exterior that led to a rich, almost buttery interior that was delicious on it's own but even better paired with all the other ingredients. What was really interesting is that the eggplant acted almost like more of a complement to the other ingredients rather than the other way around. Instead of each of those ingredients adding flavor to the eggplant, its creamy flavor smoothed out the intensity of the picked vegetables and the sumac from the onion. There was a bit of spice, a great fresh herb flavor from the tahini, and all of the vegetables added some nice crunch and freshness, creating a really delicious sandwich. 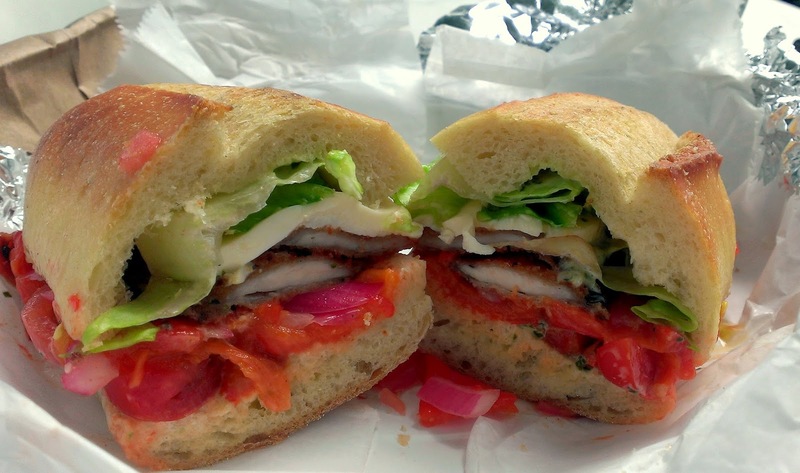 The next time I went to Mordi's, I ordered the Italiano sandwich with chicken schnitzel, mozzarella, cherry tomatoes, sumac picked red onions, lettuce, roasted peppers and aioli. The tomatoes and peppers were extremely juicy, really creating the flavor base of the sandwich. The chicken schnitzel was very well-cooked, just like the eggplant. Crispy on the outside with still-tender chicken that hadn't crossed the line into rubbery. With all of these ingredients, I was expecting the sandwich to be on the heavier side but again, the vegetables and vinegary tang helped create a really fresh, flavorful sandwich that was relatively light. That's not to say it isn't filling - it definitely is (I'd say you could split a sandwich and a side with someone and be more than satisfied), but these aren't gutbombs. The schnitzel portion is substantial, but it's not what is making up the bulk of the sandwich. Mordi's is a great and exciting new addition to the food truck scene in Jersey City and even just to the food scene in general. Beyond the schnitzel they're currently offering, Mordi's also has sides including house-made marinated olives and they've been offering fresh, homemade falafel as a recurring special and yesterday, they introduced a schnitzel platter so I'm sure there's plenty more to come. My one complaint is that the baguettes for the sandwiches can be a bit tough and chewy but on the other hand, they hold everything together really well and absorb all the delicious flavors from the sandwich. Other than that, I found the prices pretty reasonable and portions generous and again, everything just seemed really fresh. Both of my sandwiches were excellent and if you haven't been already.....stop waiting. Just go. Mordi's can be found traveling around Jersey City - they offer lunch and dinner service most weekdays and are at a lot of events around town on the weekends as well. Check their twitter to stay updated. Annual Newport Beach Party and Food Festival! 4th of July hits Jersey City!